'No Music, No Headphones': Sharon Jones On Getting Through Cancer When the R&B bandleader fell ill last year, she didn't just stop singing: She stopped listening. NPR's Arun Rath speaks with Jones about returning to the stage and the long-delayed new album Give the People What They Want. Sharon Jones' new album with the Dap-Kings, Give the People What They Want, comes out Jan. 14. 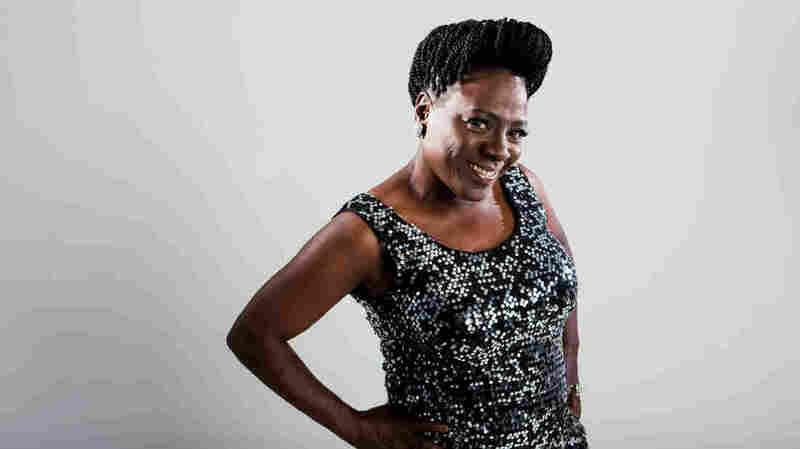 For soul music fans, the name Sharon Jones means sheer excitement and boundless energy. Jones and her band, The Dap-Kings, have been leading a classic soul revival for more than 10 years now. The band's latest album is out this Tuesday — though it isn't exactly new. Give the People What They Want was originally scheduled for release last August. Earlier that summer, however, Jones got the word that she had stage-two pancreatic cancer — and everything came to a halt. The illness, she says, didn't creep up on her: It hit her square in the back during a performance in Boise, Idaho. "The pain hit me so hard that I doubled over. But, you know, I brushed it off, came off the stage," Jones says. "That night I could barely straighten up from the pain, so what do I do? I go get a massage, thinking it's muscle-relaxing, this and that. I couldn't even lift the bag on the plane, when I would go to put my bag overhead. You know, we really have to pay more attention to our body. The signs are there; it tells you everything. But we just don't pay attention." Sharon Jones spoke with NPR's Arun Rath about what it was like to put her music aside entirely — even listening to it — and how she found it had changed when she returned. Hear the radio version at the audio link, and read part of their conversation below. It sounds like your treatment has been pretty successful. Are you finished with the chemo now? Yeah, my last chemo was New Year's Eve. I know, that was so cool. I wanted to get away faster, but I have to be patient and not go out and overdo things yet, because I'm still in the healing process. The funny part is, I'm going to be out on the road as these changes are going — as my hair is growing, my eyelashes and eyebrows are coming back — I'm going to be working and people are going to be seeing all this stuff happen as I see it. So, I'm nervous. I'm so happy that I'm getting back into the swing of things, but I'm nervous. I know for a lot of people that have been through chemotherapy, everybody's got headphones on. A lot of people use music to help them get through it. And I was the opposite. No music, no headphones. Music is my joy, is my happiness, and that's what everyone doesn't seem to understand. They're like, "What? You didn't listen to music?" No! I didn't feel happy with my music. I couldn't keep it on my mind, because that's a whole other Sharon. Music is my joy, and since I've been sick, I can't concentrate on the music. I'm just basically concentrating on trying to get well. What strikes me on the new album right from the first track, "Retreat! ", is that even though the band has been together for a while, it sounds so fresh. When I recorded that — it's been, like, a year and a half, the recording was done. When I got sick, "Retreat" had a whole different meaning. No longer was I talking to this guy: That was the cancer. And I'm telling this sickness to retreat. There are several songs here that I think probably might have a different meaning for you, having gone through your recovery. Oh, yeah. Even when I was recording "Stranger To My Happiness." The guys said, "We're going to do a video." I looked in the mirror and I said, "Wow. Do I really want to do this video, with no hair? Do I really want to do this video with this port sticking out of the top of my chest?" And then, the more I thought about it, I went in and I said, "Yeah, let me do this. Let my fans see what I'm going through." That's part of my healing process, is to not try to hide the way I look, or stay away another eight or nine months until my hair grows back, or until I think I'm strong enough. And I think, also, maybe someone out there that's going through cancer and that's going through what I'm going through can see that life doesn't stop, or sickness isn't until death. You've got to keep going, because if you get into it, that's part of the healing. That'll help you heal faster, if you try to get back into your routine. Don't look at it, don't look at it! It's brutal! You're playing 13 cities next month, from New York to Dallas. The following month is just as busy. Are you concerned about overdoing it now? No, the doctor told me to just take my time. He was like, "Don't push yourself. You'll feel how you feel." And the guys in the band have got my back, no matter what. If I'm out there 15, 20 minutes and I look at them like, "I can't do it," they know I can walk off and they can jam something and I can come back on. I sing this song in church — "I don't believe He brought me this far to leave me." I got a feeling that all these shows, all this everything, is part of my blessing. And in my heart, I know I'm going to do every show and everything is going to be OK.